London, April 23, 2018 – At Hannover Messe, Bühler today reveals a breakthrough in sorting technology that will minimize toxic contamination in maize and improve yield, by identifying and removing cancer-causing, aflatoxin-infected grains. It does this more accurately and at greater speed than any previous solution. Developed in partnership with Microsoft, the launch of LumoVision™ is a significant advance for the maize processing industry in its fight against toxic metabolites produced by fungal molds called mycotoxins, the most poisonous of which is aflatoxin. The innovation can eliminate up to 90% of contaminated maize. “Advances in digital technology, together with our sorting and food safety expertise, make this an unrivalled system that contributes to solving a major global food safety and security challenge,” says Matt Kelly, Managing Director of Digital Technologies at Bühler. Maize is a vital, staple food crop in many regions of the world and a major component in animal feed, but it is particularly prone to aflatoxin contamination. Aflatoxin is classified as a primary human carcinogen by the International Agency for Research on Cancer. Approximately 500 million people worldwide are at risk of exposure to it and it is estimated to cause up to 155,000 cases of liver cancer every year and contribute to stunting the growth of millions of children. “Aflatoxin is one of the biggest global pains today. Climate change means that the problem is growing, so eliminating contaminated grains from the food chain more effectively, with less loss of healthy grain, is an urgent challenge,” says Beatrice Conde-Petit, Food Safety Officer at Bühler. LumoVision is the first optical sorting technology able to identify aflatoxin based on direct indicators of contamination, while simultaneously using real-time, cloud-based data to monitor and analyze contamination risk. 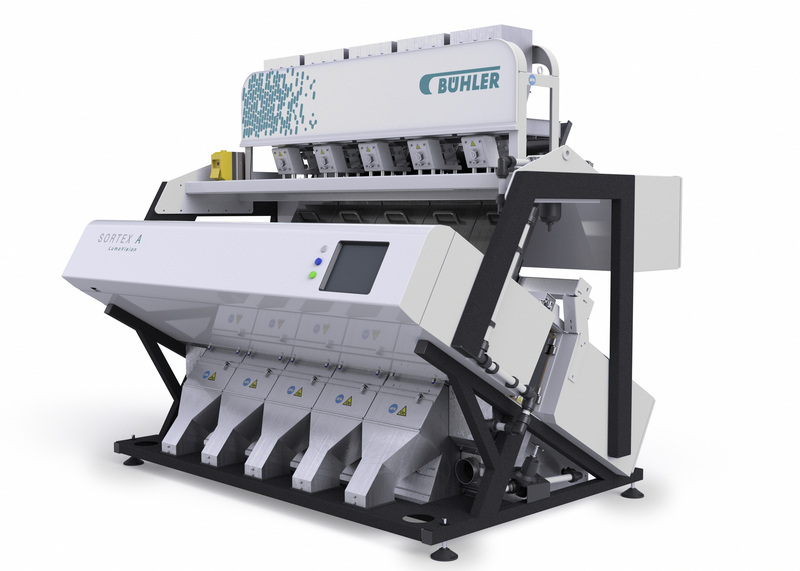 It works by analyzing the color each kernel fluoresces as it passes under powerful UV lighting in the sorter. 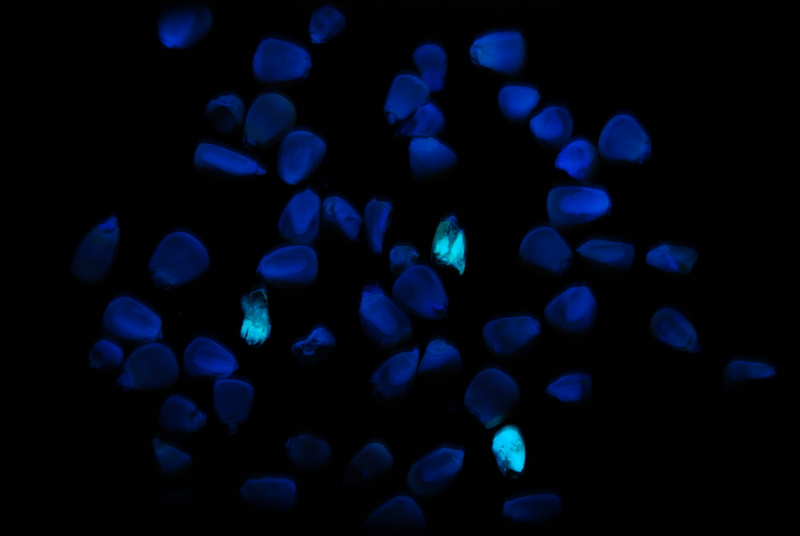 It is known that contaminated kernels fluoresce a specific bright green color. LumoVision’s proprietary, highly sensitive cameras detect precisely this color of fluorescence. Within milliseconds of detection, air nozzles deploy to blow contaminated kernels out of the product stream. The machine processes up to 15 tons of product an hour, eliminating up to 90% of contamination – a significant improvement on current solutions. A cloud-based solution using infrastructure provided by Microsoft is a key enabler to reducing overall yield loss. Combining data from the cameras with data stored in the cloud allows a local, real-time analysis of the risk of contamination to be carried out. When the risk is minimal, sorting is halted while the machine continues to monitor. If the risk rises, sorting automatically restarts. LumoVision, coupled with the cloud service, reduces yield loss to below 5%, compared with between 5% and up to 25% for other current solutions. “We are incredibly excited about this achievement. As an organization we have strived to solve the problem of aflatoxin contamination for many years. Now, with today’s technological advances we’re able to bring this ground-breaking solution to market,” says Ben Deefholts, Senior Research Engineer for Digital Technologies at Bühler. “With data science techniques and tools we can develop sorting algorithms, while connectivity and IoT solutions allow us to combine our optical sorting with real-time risk models,” he adds. With LumoVision, food, feed, and pet food manufacturers can protect their product from contamination, avoid the cost of expensive recalls and reputational consequences, while increasing yields and reducing waste. Grain handlers can upgrade the quality of their product to attract higher prices. However, it is in regions of the world where there is no food safety regulation or where low resource communities have little choice but to eat contaminated food or go hungry, that LumoVision can have an even bigger impact, saving lives and improving livelihoods. Visit us at the Microsoft booth at the ‘digital factory fair’ Hannover Messe, booth C40, hall 7, from Monday, April 23, to Friday, April 27, 2018. You can get more information and download the white paper on the LumoVision microsite.